The book is Coders at Work: Reflections on the Craft of Programming, by Peter Siebel [amazon.com, amazon.co.uk]. It’s a series of lengthy, rambing interviews, averaging forty pages each, with fifteen programmers. These include some seriously big hitters: among others, Jamie Zawinsky, Peter Norvig, Guy L. Steele, my own hero Ken Thompson, and finally — saved for the last chapter — Don Knuth. None of the programmers seemed to have any time at all for formal design methodologies like UML. While everyone recognised the value of informally whiteboarding ideas before ploughing into coding, there’s an overwhelming sense from these people that they prefer to start with only a broad design, and then refine as they code, discovering the details of the problem as they go. No-one likes C++. It seems to be regarded as, at best, a noble attempt to graft two incompatible worlds together. Andrew Rilstone, in his review of Ang Lee’s film Hulk, memorably described it as “The whole thing doesn’t quite work, but it’s the sort of failure one would like to see rather more of”. The impression you get of C++ from Coders at Work is that it was a success, but the sort of success one would like to see less of. Lots of the interviewees were interested in functional programming. Not in a religious thou-shalt-not-evoke-side-effects way, but as a practical tool to have in the kit. One of the effects of this has been to make me think, again, that it really is time that I got properly to grips with Lisp (or, specifically, Scheme, which everyone agrees is the purest, and therefore the most Lispish, Lisp). A few of the programmers were more rigorous about referential transparency, but they were the ones who needed it for parallelising computions. Most people don’t bother with debuggers (GDB and the like), preferring to debug using low-tech approaches like the insertion of printf()s. I was surprised by this, although I’d read something similar in Kernighan and Pike’s (1999) The Practice of Programming. As a matter of fact, that’s how I do most of my own debugging, but I’d always felt that it was a bit of a guilty secret and that I really should invest more effort into learning debuggers. It’s nice to know that I am at least in good company. Everyone spoke highly of Knuth’s The Art of Computer Programming, and plenty of people owned copies that they dipped into from time to time, but only one person had actually read it all the way through. (I don’t remember who, sorry). In an interview I said [that I didn’t use C++] just because it wouldn’t stay still for two days in a row. When Stroustrup read the interview he came screaming into my room about how I was undermining him and what I said mattered and I said it was a bad language. I never said it was a bad language. On and on and on. Since then I kind of avoid that kind of stuff. Peter Siebel summarises some of his interviewees’ thoughts on C++ on his own blog. Shortish and well worth a read. Also intereasting, if you want to sample the book before committing real, live money, is this selection of quotes. Why is the book good? (I’ll try to finish all my book-related articles by addressing this question.) Because it offers a slice through time, covering more than half a century of programming. While an amazing amount has changed in that time (plenty of the interviewees have experience with punch-cards, paper tape and toggle-switches on a front-panel), a surprising amount has also stayed the same. Seems to me that any insights into programming that are good across fifty years are carrying some real weight. This entry was posted in Books, Programming, Programming books. Bookmark the permalink. Published in 1972, could it be “The C Programming Language” by Ken and Dennis? Good guess, Dennis, but no — The C Programming Language was a relative latecomer, published only in 1978. Still, I will give you half a point. “Structured Programming” : Dijkstra, Dahl? My first guess was “The C Programming Language” as well. The AHU algorithms book? It’s still one of my favorites. Good guesses, but no … I’ve written the post about the 1974 book I had in mind, and will probably post it tomorrow. Stay tuned! I enjoyed this post! What refreshing thinking. Although I’m only a hobbyist programmer, I can somehow relate, and the book is going onto my wishlist right now. Well, Volume 1 of Knuth’s The Art of Computer Programming, Fundamental Algorithms, was first published in 1968. To me, as a professional software engineer, those 3 volumes are the Bible of the domain. I strongly recommend that you learn Lisp, not Scheme if you want to understand the appeal of the language. Scheme is a stripped down subset designed for teaching certain elements of program structure. Lisp is an actual programming language and contains a great deal more. Both languages have closures, garbage collection and a similar set of data types, but Lisp has a number of other important elements. For example, Lisp code is plastic. The source language may be text, but the input to the compiler (and interpreter) is list structure. This means that the programmer can do code transformation and use it as part of system design. Need a specialized code construct, just write a suitable macro. Properly used, this can make your code much more readable. You design your problem solving language, then implement it using macros. The output is interpreter and compiler ready. There are lots of other features in Lisp that make it more of a complete language than Scheme. Sure, learn Scheme and read SICP, but Scheme is a distillaion of Lisp, not a substitute. Kaleberg, thanks for this advice. I’d understood that Scheme IS Lisp; just a specific, and rather spartan, dialect of Lisp compared with some others, such as Common Lisp. Not so? And of course there’s Emacs Lisp, which is appealing in that I am already very comfortable with Emacs. Any suggestions? Scheme is a dialect of Lisp, but it has stripped down for pedagogical purposes. If you want to study control and access structure, you can’t do better than to pick a Scheme and pick up SICP and learn an awful lot while having a surprising amount of fun. I’ve used MIT Scheme. I worked on a port to the BB&N 256 processor Butterfly back in the 80s. It’s portable and open source. I’ve tinkered with PLT Scheme which isn’t bad either. I’m guessing that they are different branches of the original MIT code. A lot depends on what you think of the user interface. There was good EMACS / Scheme integration (^Xe to execute Scheme in a shell buffer). On the other hand. If you want a production language, I’ll recommend Common Lisp. CLISP worked pretty well. When I used it, KCL (Kyoto) was a bit clunky. To be honest, I did most of my Lisp programming before Common Lisp. I used the old PDP-10 ITS version at the MIT AI Lab. One guy there had a wall full of pennies, one for each major implementation upgrade. I wrote a tiny Lisp for a group at MIT, and my first user was a high school band guy who wanted to do computer animation. He won an Oscar for his work on flocking and schooling. He’s the only guy I know who ever won an Oscar. I also worked with Zeta-Lisp, the Symbolics version, which had a proto-Common Lisp typing system along with what a lot of Lisp purists called too many libraries. Scheme is a magnificent teaching tool, but Common Lisp is for building systems. It has an easier to use package system for namespaces. It has a full object system with inheritance, mix-ins, methods and so on. It has more advanced data structures. It has Lisp’s macro capabilities which are extremely important since they let you mold the language to the program’s semantic space. I haven’t used all that much, except for the EMACS version, for years. The original EMACS Lisp was an implementation of EMACS for Multics and it was written completely in Lisp. Things like save-excursion were built as Lisp macros. On the other hand, it looks like some of the implementations I remember are still around. Inform 7 (inform7.com) is also written in a “literate programming” form of C, in addition to being a literate programming tool itself. I have been writing commercial software for 30 years, ranging from accounting software to real-time embedded safety-critical systems, to large-scale distributed enterprise manufacturing execution software. 1. I love C++. It’s power to express and implement complex abstractions for robust system software is unparalleled, IMO. 2. I also love UML, although I have had my toe-to-toe encounters with the likes of Grady Booch, et al over major and minor disagreements about semantics. Some of the stuff I have developed would not have been feasible without some sort of formal modeling tools. At the very least it helps one fully cognate on what you are trying to accomplish. The more complex the problem, the more useful formal tools become. I love Java. Lots of people love Java. Lots of the most exciting projects in software are happening in Java: Cassandra, Hadoop, Lucene. And these are research-like projects created by super passionate super knowledgeable guys who picked Java on purpose. Lots of staff at Google love Java and they use it in various projects. Even things like Ruby on Rails were obviously heavily influenced by Java MVC web frameworks and test-centric development tools. I could go on and on. Some parts of Java are crufty: JSF is awful. The maze of libraries to do something simple like logging can be completely unnecessary chaos. I never liked J2EE or Hibernate or JPA either. But, Java is easily the most exciting dev platform for me. It’s a great language, a great VM, has great Win/Mac/Linux OS support, and the richest development community. It’s still just a language/VM system… It’s nothing magical. But I really think you are off the mark when you say no one is excited about it. Mass, while I take your point that there are people out there who genuinely love Java, I found this part of your comment unintentionally revealing: “Even things like Ruby on Rails were obviously heavily influenced by Java MVC web frameworks and test-centric development tools.” It’s a typically Javacentric perspective to assume that Rails’s use of MVC is taken from the Java world, when in fact MVC long predates that language, having been described by Trygve Reenskaug in the 1970s. It may not be true of you personally, but my experience is that Java people are often Java-only people, and don’t see far beyond the boundaries of their gated community. I don’t think that’s a healthy place to be. To me, Java is C++ on training wheels… :-) Some of the systems I have designed would not have been possible without language support for multiple inheritance for example, and how java forces you to code interface class functions into each concrete class that inherits from the interface class is just a major PITA! Some sort of default behavior for an interface would be genuinely useful. As for platform independence, I haven’t had any problems with that issue when using C++ in a rational way. I’ve been developing systems and frameworks in C++ for almost 20 years that ported without difficulty to pretty much every OS known that had a decent C++ compiler. Of course, I’ve uncovered a number of bugs in those compilers (mostly the proprietary ones) that had to be fixed. We had to “rap the knuckles” of the VPs of Engineering at HP, DEC, and Sun in the past to get them fixed PDQ, but once they decided that dealing with the problem was easier than another phone call from me, the fixes were available within days. In any case, some code that is entirely dependent upon specifics of processor architecture has to be implemented differently to deal with those specifics. In such a case, it is likely that you would have to use some JNI interfaces to C functions for those since it is difficult to deal with machine-level dependencies in Java. Have you ever read “Programmers at Work” [ISBN: 0914845713]? “Coders at Work” almost seems to be an update to the former; maybe related is a better word for it. But from what everybody says I need to check it out. Oh, another interesting (and possibly related) book is “Show Stopper!” [ISBN: 0029356717] by G. Pascal Zachary who followed the Windows NT development team for Windows NT from conception to delivery. Intriguing and riveting. You see some of that in every platform. I’ve worked in 100% Microsoft oriented companies for the last ten years, and know tons of Microsoft-only people who’ve never heard of anything that’s not a Microsoft promoted tool. And I see tons of the same type of closed-minded superiority in Ruby circles. Isn’t the premeire Java version-control-system, Mercurial, written in Python? Hasn’t Java very aggressive about supporting and integrating with every other language and platform? Lots of non-Java PHP/Python programmers that I know swear by NetBeans as the best IDE. Doesn’t the JVM have a vibrant support for community developed languages (Scala, Clojure, etc) and libraries? Your laments on the current state of API-gluing programming careers is pure briliance. However, your anti-Java sentiment is every bit as “gated” and closed-minded as the stodgy Java culture that you dislike. 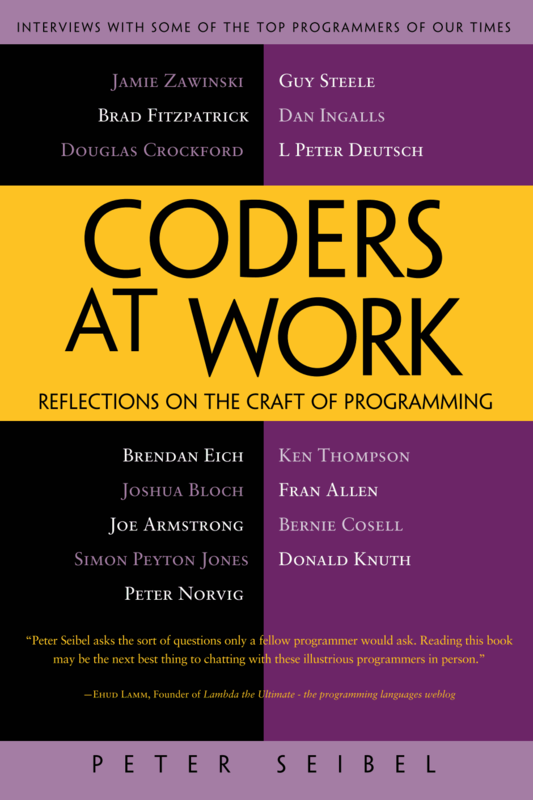 I’d never even heard of Programmers at Work at the time I published my Coders review, which is a bit odd — you’d have thought that Peter Siebel would at least have mentioned the older book in the newer one. But anyway, I ordered a second-hand copy two days ago, and I’ll probably cover it here at some point. I think I’ll skip the NT book, though: I am not a big NT fan, to put it mildly, and knowing how much it cost people to make it isn’t going to make me happy. Regarding “Show Stopper!”, sorry if my point about it was unclear. It’s not so much a reading of the internals of Windows NT; there are plenty of other books about that. One part that’s always stood out in my mind is the developer that was so overcome by the project that he broke down and started spending his cubicle days finding ways to win at Windows Solitaire. It’s just a good, overall read on what goes into a major development project that many of us will never have the chance to experience – for good or bad. I never said it was a bad language. […] But by and large I think it’s a bad language.